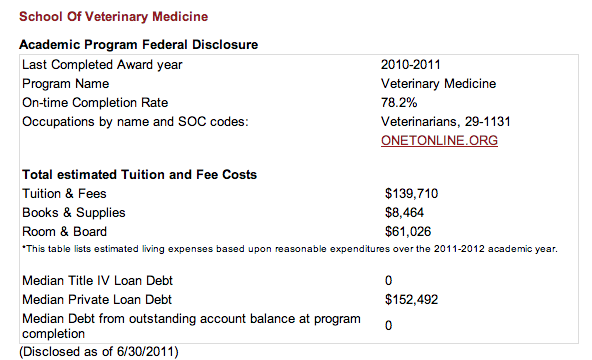 Why do the MDs get federal loans and DVMs don't?!? So of course I clicked on it. 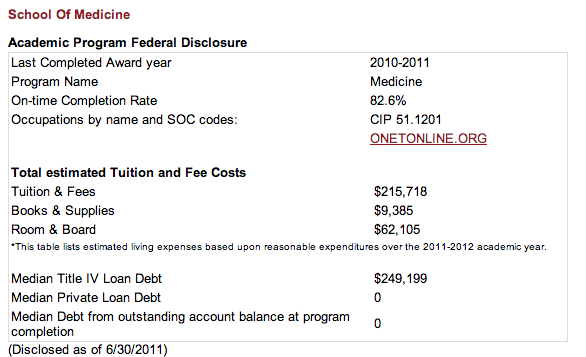 And I find out that as of 06/30/2011 MD students qualify for TItle IV loans at St George's, but DVM students do not. Oh, right. Because those figures are from 2011. Even though it's 2013. Hmmmm. Back in 2011 St. George's School of Veterinary Medicine wasn't accredited. So students couldn't get federal loans, instead taking out private loans at oh, 12-15% with interest accruing from day of disbursement. In contrast, in 2011 GradPLUS loans were at 6.8% and subsidized Direct loans at 3.4% with no interest in school or for 6 months after graduation. Anybody want to guess the difference that makes in total paid over a 30 year loan repayment schedule?